With the 2013-14 NBA Season just around the corner, Ball So Hard is bringing you the definitive ranking of every NBA team, counting down each conference from 15-1. Think we’re wrong? Let me know in the comment section below. Last season, the Blazers boasted the Rookie of the Year and an All-Star power forward in their line-up, but still found themselves languishing in the lottery on draft night. Why? Because they had one of the weakest benches in the league. Damian Lillard, LaMarcus Aldridge and Nicolas Batum did most of the heavy lifting for Portland last year, but their second unit, which boasted the likes of Victor Claver and Joel Freeland didn’t strike much fear into their opposition. Heading into this season, the Blazers have definitely addressed that issue, adding both heady veterans and exciting prospects to their squad. Last year Portland relied on the 6-9 J.J. Hickson at centre, and while he did average a double-double, he could never provide the defensive presence they needed beside Aldridge. Step in Robin Lopez who can be the true rim-protecting 7-footer they so desperately needed last season. 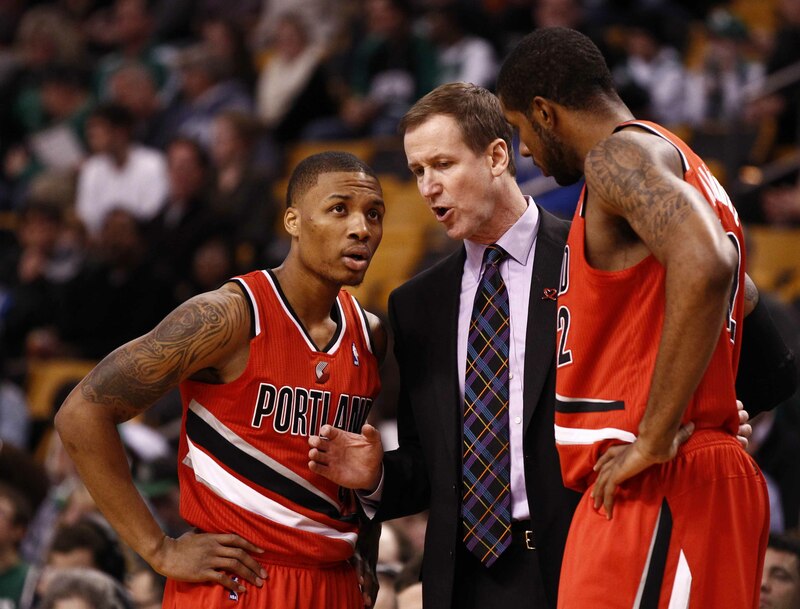 Mo Williams, and to a lesser extent Earl Watson, will also provide some much needed support to Lillard. Last season the former Weber State guard logged the most minutes of any player in the league and the Blazers will be desperate to ensure their young star is no risk to burn out during his sophomore season. Their other free agent addition, sharpshooter Dorell Wright, should also help improve their ranking in the bottom third of the league for three-point percentage. Perhaps the most exciting additions to the team though are C.J. McCollum and Thomas Robinson. McCollum shot 51.6% from downtown in his senior year at Lehigh and 49.5% from the field while notching up 23.9 points per game. His ability to hit from the outside and put points on the board will help improve the aforementioned struggles from beyond the arc, and alleviate some of the scoring pressure from Lillard and Aldridge. Meanwhile, Robinson might be on his third team, but he is only one year removed from being a top five pick in the draft and receiving him in exchange for two internationals and two second round picks was daylight robbery. Look for Robinson to finally showcase the skill set – high energy rebounding and post scoring – that warranted his high draft position. The Blazers did have a productive offseason, but they are still one game-changing signature/deal away from being a threat in the West. Is the promise of eventual playoff appearances enough to keep an unsettled LaMarcus Aldridge happy? Aldridge is entering his eighth season in the league, but has never advanced past the first round of the playoffs. Portland need to prove to their star that they are headed not only back to the playoffs, but that they can also make a meaningful run. At 28 years old, Aldridge is in his prime and wants to win now. The two-time All-Star will not be short of suitors either, and his hometown Dallas Mavericks’ owner Mark Cuban has made no secret of his admiration for the sharpshooting former Texas Longhorn. The Blazers are on the cusp of making a return to postseason action and will be desperate to hold onto their big man. But if Aldridge decides he can’t wait another season to make a run at a championship, and Portland receive an offer that won’t hinder their development, the Blazers could surrender their star forward. In the end it is Aldridge that will decide his own fate. Can he continue to play at a high level and create a winning culture in Portland? Or will he give up on the team that drafted him second overall in 2006 and try and force his way into a winning situation?